Japanese fantasy artist influenced by Manga, psychedelic and pop art, art nouveau and ukiyo-e. He's mainly worked in animation, illustrations, and video game conceptual designs. Every single game of the main Final Fantasy series to some degree. Title logos for each title in the main series. Up to the sixth entry, he was the series' character designer. He has since handed that duty to Tetsuya Nomura and has produced promotional artwork for each entry thereafter. Excluding VII (only dubiously, Amano still worked on the concept sketches) and IX, all of the mainline series uses his work for the title. Nomura handles the character designs of the game, but Amano still does the artistic graphics. He also did Final Fantasy IX's character designs, as FFIX was meant as a throwback to the first six games in the series. Ironically, however, FFIX is the only installment of the main franchise whose central logo was designed by someone else than Amano. 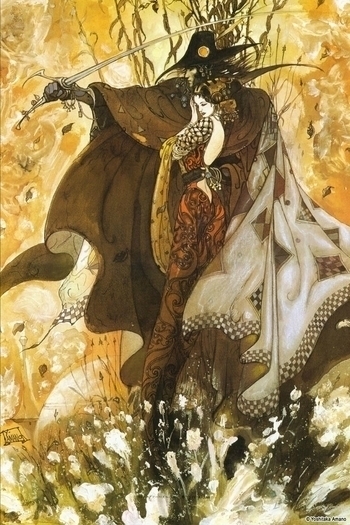 Cover art and interior illustrations for the Vampire Hunter D light novel series, as well as the character designs for the first movie. Radio City Fantasy, an early surrealist OVA scripted by Takeshi Shudo. The Sandman: The Dream Hunters, in collaboration with Neil Gaiman. The illustrations for the Japanese editions of the Elric novels. Character designs for most of Tatsunoko Production's landmark early anime, including Science Ninja Team Gatchaman (which makes him more or less the godfather of the Five-Man Band), Neo Human Casshern, Speed Racer, and several of the Time Bokan series, including Yatterman (which makes him more or less the godfather of the Terrible Trio). Designing the original Tekkaman... so he is the godfather of SPACE LANCE! The covers of Japanese neo-classical metal band Galneryus's first three albums, The Flag of Punishment, Advance to the Fall and Beyond the End of Despair. Elektra and Wolverine: The Redeemer, written by Greg Rucka. No, really. Tanaka Yoshiki's novel series The Heroic Legend of Arslan (or, in Japanese, Arslan Senki). He did the covers, additional illustrations plus drama CD illustrations. Most of his work on Arslan was published in the artbook Tenma no yume - The Heroic Legend of Arslan which features additional poetry by Tanaka Yoshiki. Hiroshi Aramata's Teito Monogatari novel series. He did the covers for its first republication. Lily C.A.T. had Yoshitaka provide character and monster designs. He's also a David Bowie fan, apparently.